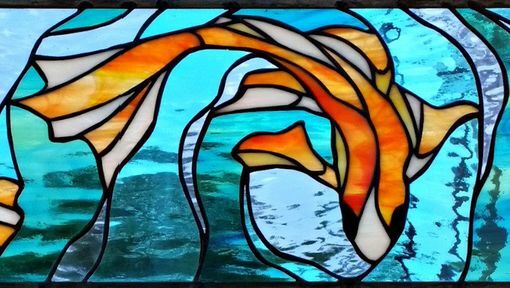 This lovely stained glass transom window has an organic flow of multi toned water to set the backdrop for the brightly colored goldfish. All the water is done in shades of aqua blues and sea green transparent waterglass textures. To make the gold fish stand out as a focal point we made those with translucent opal textures in shades of oranges, yellows and whites. The photos shown of the original piece are 34 7/8" wide X 9 1/4" tall but the design can me modified to fit just about any size and shape you may need for you home.